These 2 pretties are part of Jessica's Peacock Queen Collection. There is one more color in the collection but I wasn't as interested in it as much as these two. Swatches and a possible comparison after the jump! I was most excited for Iridescent eye. It is said to be a dupe of Chanel Peridot. (Scrangie has some good dupe comparisons here) I'm really into duochrome, multi color flashing, polishes right no. After I bought Hard Candy Beetle and finally tracked down Orly Space Cadet at Ulta, I know I had to have another color! Here it is in all it's glory! I had no issues with application and I did enjoy how metallic this polish was. No complaints really... EXCEPT it doesn't have as much color flash as it does in the bottle :[ You can really see the gold-ish, green, and blue flashes when you look at the bottle. But once on the nail all you get is the gold and some green. Don't get me wrong! It's a pretty polish and I'm LOVING it in my collection, I guess I was expecting too much? I'm loving this polish. Smoky Feather is a gritty, sparkly, foil polish. There also is some holographic glitter through out which makes it even more awesome! 2 coats, no issues! I really love the sparkle in this! This is also said to be a dupe of Chanel Graphite. 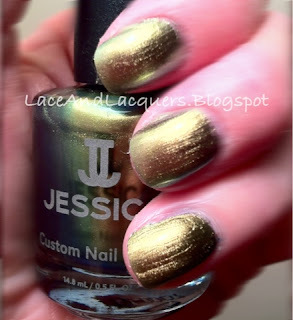 Jessica Smoky Feather: blurred to show holographic glitter. Comparison of Jessica Smoky Feather and Revlon Carbonite. 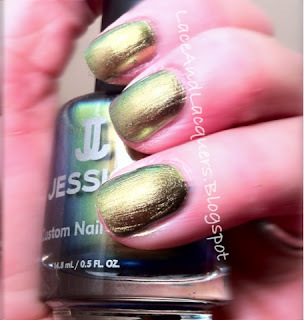 Jessica is obviously a lot more foil-like and has more shimmer. Carbonite does not have the holographic glitter. It also is a lot easier to see the particles (not sure what else to refer to them right now lmao) of color separately in Revlon's version, I think. Over all, they're different, but still awesome in their own way! From looking at pictures, I'd say Jessica's Smoky Feather is more of a dupe for Chanel Graphite than Revlon Carbonite is. TL;DR?! From looking at the Chanel swatches online, these seem to be pretty good dupes of the more expensive polishes! Even then, these are awesome polishes with great color and sparkle. There were no issues with application. They look so beautiful! Great swatches, and thanks for the comparison to Carbonite. I have Carbonite. I wonder if I add a coat of CG Fairy Dust holographic glitter if it will look more like Graphite.